I finally managed to borrow this wonderful book that was on my Reading List for almost a year. Now that I have read it, I am awed and humbled by the perseverance and dedication of this human being to build a school in a tiny little village tucked away in the formidable Karakoram mountain range. And, the school was only the beginning. Leading a spartan existence, working just long and hard enough to save up for his next climbing expedition, Greg Mortensen seemed the most unlikely ambassador to bring a ray of hope for a better life in the harsh, cold and forbidding part of the Himalayan Pakistan, where people are desperately poor in their day-to-day existence but brimming with patience and optimism for a single step forward. When Mortensen gets exasperated about the delay in starting construction Haji Ali, the village chief says smiling, "...the people of Korphe have been here without a school for six hundred years. What is one more winter?" Author Relin evokes the beauty and the power of this region through vivid descriptions of the formidable ice sheets and glaciers, mighty peaks daring the strongest of men to reconsider their resolve to summit the peaks, and the indefatigable zeal with which the Indus and Balti rivers pound the mighty rocks to have their way. Mortensen's own apprehensions of bringing 'civilization' to this part of the world are explored in the book - building a bridge could open up this remote and sheltered area to unwanted external interference, the schools could potentially drive the men away from the village seeking better fortune elsewhere leaving their families behind, however, empowering the girls/women would certainly ensure that the future generations could hold their destiny in their own hands. The author writes, "the Balti held the key to a kind of uncomplicated happiness that was disappearing in the developing world." This peaceful simplicity of life, taking the harsh daily struggles in their stride, seems to be the strength of the Balti people that attracts Mortenson to the villagers. It is not easy to understand, let alone respect, the hospitality culture that is prevalent in the East. To give away something, even the choicest morsel of food to the guest, be it the last bit of food in the household, is considered a privilege and is given without expecting anything much in return. Offering a scalding cup of butter tea to the restless and anxious Mortensen, Haji Ali explains, "The first time you share tea with a Balti, you are a stranger. The second time you take tea, you are an honored guest. 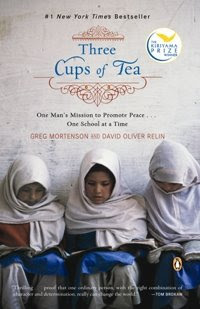 The third time you share a cup of tea, you become family, and for our family, we are prepared to do anything, even die." As the book notes, Sir Edmund Hillary built a number of schools in the Himalayan region, but, he was successful in his attempt to summit Mount Everest which afforded him a certain celebrity status that he could then leverage to raise the funds for his mission. It is all the more compelling to read how Mortensen did it. was just going through your blog. you seem to be very creative :-) i just dont have the patience for stitching.. but this looks so beautiful :-) Cheers to you!! !